The polarization between presidential candidates Jair Bolsonaro and Fernando Haddad, who respectively have the highest and second highest voting intention poll numbers, shows a fierce battle for the future of Brazil. As the elections are held this Sunday, Oct. 7, tensions mount between opposing projects for the 2019-2022 presidential term. According to Maria Aparecida de Aquino, a History professor at the University of São Paulo, today’s vote is very different from previous elections held in Brazil since its transition to democracy, in 1985, after 21 years of dictatorship. ::: The Brazil elections: How did we get here and what is at stake? Not even in contexts of social divide before 1985, like the suicide of former president Getúlio Vargas in 1954, Brazil had seen such clear polarization. “The only time we can say there has been an escalation and a battle between very different sides was in the 1989 elections, and even then, it was not even near what we are witnessing now. It feels like society has split. This is an absolutely singular moment in Brazil’s republican history,” the historian says. Aquino recalls the far-right candidate’s VP running mate, General Hamilton Mourão, is also outspokenly conservative and authoritarian. He has recently decried the 13th salary Brazilians who have formal jobs are required to receive, and admitted last month a “self-coup” could be staged by the president with the Armed Forces. “Our democracy is under threat. I cannot see how this could be more threatening and dangerous. Brazil will be faced with very tough times ahead of us,” Aquino says about Mourão’s declarations. “If there is a possibility that this man [Bolsonaro] takes over the Palácio do Planalto [presidential office], the Brazilian society will face a huge risk, and democracy will too. Everything this man and his partisans say are about rupturing democracy,” she points out. 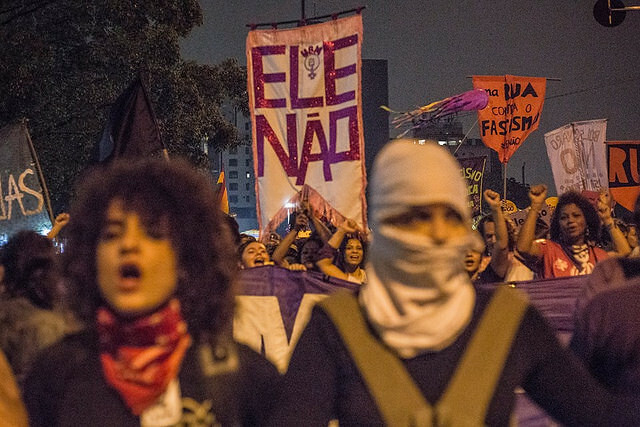 In her opinion, if Bolsonaro is elected, he will intensify the attacks against social rights that have been happening over the past 3 years with reforms pushed by the Michel Temer administration. Leidiano Farias, a historian and member of the People’s Brazil Front, says another unique aspect of this election process is that it is happening amid a deep economic and political crisis. Brazilians are disenchanted with the political system in general, and that reduced the weight of TV ads and the power some parties have to campaign. “Voters are looking at candidates that they see as anti-system. And the main anti-system candidates right now are Jair Bolsonaro and Fernando Haddad. On the right, Bolsonaro is anti-system in a sense that it comes from a fascist point of view, while Haddad is anti-system on the left. These two candidates are polarizing right now,” Farias says. The economic and political crisis is reflected on social issues that devastate the country. Official government data show 12,7 million people were unemployed in September. The figures that show that extreme poverty is back in Brazil are also striking. Approximately 12 million Brazilians are below the extreme poverty line, earning less than 20 dollars a month, according to ActionAid Brazil. Farias believes this poll is key to Brazil’s history. “What is at stake this Sunday, and possibly the runoff vote [on Oct. 28], is whether we will restore democracy and national sovereignty or recognize the legitimacy of the  coup on the ballot. The election is happening in a moment when the country is under a coup d’état. A win for a candidate like Jair Bolsonaro will only legitimize this coup. It will legitimize the neoliberal reforms, such as the Labor Refor, which represents a setback against what workers have achieved throughout history,” he says. The victory of this conservative project, Farias adds, would also maintain the Constitutional Amendment 95, an austerity measure criticized by specialists and social movements, as it froze public investments in health and education for 20 years. For the historian, having politicians like Bolsonaro, a retired army captain, and his running mate General Moural in the presidency would consolidate a process in which the military has control over Brazilian democracy. Opinion polls have been showing Jair Bolsonaro in the lead, followed by Haddad. Statistics show huge differences between each candidate's consituents. Among upper-middle class and upper class voters, 53 percent say they are voting for Bolsonaro, while 28 percent of lower class voters say they support Haddad. Farias says these data show the polarization is also about class struggle. “Of all elections after the transition to democracy, this is the time when class interests are clearer than ever. It’s not a coincidence that the most important people’s leader is incarcerated in Curitiba right now. I’m talking about president [Luiz Inácio] Lula [da Silva]. The elite, Brazil’s ruling class, removed an organic representative of the working class from the election process. That is called class struggle,” Farias argues. “Evidently, the 1989 elections were very important, because they were the first polls after more than two decades of dictatorship, but we can say that these elections play a key role for people’s sovereignty and the restoration of democracy,” the historian says. Despite the grim landscape, historian Maria Aparecido de Aquino believes conservatism will not be victorious. “We will live very difficult moments, because the crisis has been brutally deepening over the past 3 years. No one will have an easy government. I also believe the progressive forces will come together and that will make it possible for us to overcome this aggressive crisis we are right now,” she says. Farias reiterates how important this election is and says that only the victory of democratic and people’s forces can change the correlation of political forces that have the goal of restoring democracy and defending the country’s strategic industries, such as Petrobras and Eletrobras, which are key to the country's democracy.